Will Your Baby Be Born By Scheduled Cesarean? Prepare Now! 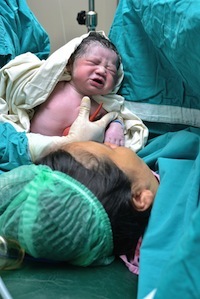 While vaginal birth is the safest way to birth for most mothers and babies, there are medical reasons why some babies are born by scheduled cesarean. If your baby will be born by cesarean, here are some things to consider. Learn more about gentle cesareans, also called family centered cesareans. Watch this video with Dr. Camann and this one which shows what’s possible during a cesarean. One of the most important parts of a woman’s cesarean birth story is usually whether or not she was able to be with her baby right away. With gentle cesareans women are holding their newborns skin to skin, and even breastfeeding them, during the cesarean. If this is not possible, ask that your partner or another family member be able hold the baby skin to skin immediately. An upcoming cesarean birth can be anxiety provoking and taking a Prepare for Cesarean Birth, Heal Faster one hour phone session will help you to relax prenatally and heal faster postpartum. This program, created by Peggy Huddleston for surgical patients, and developed by me to meet the needs of cesarean moms, includes a book and relaxation cd. It has been shown to reduce anxiety and help with insomnia prenatally, and decrease recovery time. Because the mother and baby communicate constantly hormonally during pregnancy, being able to relax now will allow your baby to relax as well. The baby who is relaxed prenatally, is the baby who will be a calmer newborn. One support person, often the partner, is almost always present during cesareans. He or she sits on a stool behind the mother's shoulders, and can’t see the surgery. Both parents see the baby being lifted over the drapes. It may be possible for you to have a second support person, such as your mother, sister, best friend, or doula, with you as well. Doulas aren’t just for vaginal births. A doula can help you remain calm before and during your cesarean birth, and to help you with breastfeeding afterwards. Meet with your anesthesiologist ahead of time to get answers to your anesthesia questions, and to ensure that your doula or other second support person can be with you in the operating room. Having two support people means that if the baby needs to go to the NICU, one person can be with the baby and one with the mom. Your partner, or anyone who has spent a lot of time with you during your pregnancy, will be a familiar and reassuring presence to the baby, who will recognize his or her voice. Prepare now for postpartum. A postpartum doula will help you during your recovery at home. Moms who have had cesareans are usually told not to lift anything heavier than the baby. That means no laundry and no carrying groceries during the weeks you are recovering. Learn about breastfeeding while you’re pregnant and consider attending a La Leche League or other breastfeeding support meeting now. You will be able to take pain medications that are compatible with breastfeeding. We’re beginning to understand the human microbiome and how being born by cesarean affects a baby’s microbiome. While the research is in its infancy, some women are now using a vaginal swab to inoculate their newborns in order to expose them to the bacteria they would have encountered had they been born vaginally. Finally know that even though this baby needs to be born by cesarean, you may be able to give birth to your next baby vaginally (VBAC). The International Cesarean Awareness Network is a great resource for women recovering from cesareans or preparing to VBAC.